Governor Janet Mills speaks at a news conference in the State House on Wednesday in Augusta. Mills is accompanied by Department of Corrections Commissioner Randy Liberty, left, Director of Opioid Response Gordon Smith, second from right, and Department of Health and Human Services Commissioner Jeanne Lambrew. Mills later signed an executive order directing immediate action on the opioid epidemic. AUGUSTA, Maine — In her first targeted response to Maine’s opioid crisis, Gov. 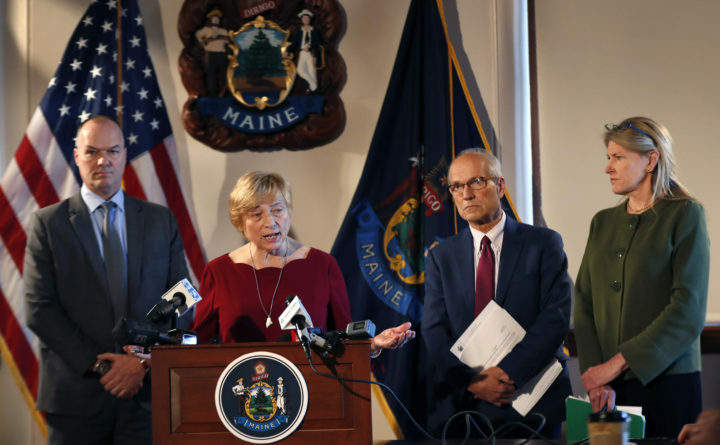 Janet Mills signed a Wednesday order aiming to boost addiction treatment and setting aside $1.6 million to expand access to an overdose antidote and recovery coaches in health care settings. Fighting opioid addiction has been an early priority for the new Democratic governor after fentanyl and heroin drove Maine’s overdose death total to 418 in 2017. The same year, approximately 7 percent of all babies born in the statewere affected by opiates or other drugs. Like many states, Maine has struggled with a lack of treatment capacity. A federal estimate said between 25,000 and 30,000 people here want to enroll in a recovery program but can’t access one. On a single day in 2015, less than 5,300 people were being treated with one of the two most common medications used to treat opioid addiction, according to the federal government. In just more than a month as governor, Mills has named an opioid response czar and expanded Medicaid to more than 3,200 people under the first executive order of her administration. It’s unclear so far how many people are being treated for addiction under expansion. On Wednesday, she signed another executive order that set a state goal of boosting medication-assisted treatment in health care settings, jails and prisons, expanding access to naloxone, an opioid overdose antidote and taking long-term action to boost prevention efforts. It is backed by $1.6 million in existing state and federal funds that Gordon Smith, Mills’ opioid response director, said will be used to buy 35,000 doses of naloxone to distribute throughout the state and train 250 recovery coaches — and install coaches in 10 emergency rooms. Recovery coaches — who are usually volunteers — can help develop a recovery plan and connect a patient to services. Smith said there are about 600 coaches statewide now, but not all hospitals have them and their schedules and the circumstances of their training can be uneven. “I consider it a down payment to get these things out where they need to be,” Smith said of the opioid package at a news conference alongside Mills on Wednesday. Mills’ executive order continues an early trend of her administration — paying for new initiatives with existing funds. In January, the new governor expanded Medicaid using surplus funds after the voter-approved expansion was delayed for most of a year by former Gov. Paul LePage. Her order editorialized that past addiction responses have been “inadequate,” a view that most experts share and a dig at LePage, a Republican who once said naloxone “merely extends” lives. His administration’s opioid health home model had success in 2018 after a bad start. Many of the changes that Mills wants to make will require legislation. On Wednesday, she said she is targeting the state’s two-year caps on Medicaid treatment using methadone and suboxone. She has also called for raising Medicaid reimbursement rates for treatment. Wednesday’s order underscores financial constraints that Mills is operating under. It said Smith will be tasked with funding the order’s initiatives without state tax money. She has said her two-year budget proposal — which is due to the Legislature on Friday — won’t raise taxes while increasing funding for schools and providing long-term Medicaid expansion funding. Mark Publicker, a Portland-based addiction treatment specialist who has been a leading critic of the state’s response, called the package “excellent” as a framework of priorities on Wednesday, though he quibbled with the focus on recovery coaches and said the first priority for funding should be reimbursement rates and medication-assisted treatment. “Honestly, I think had these been put into place under the last governor, I don’t know how many people’s lives would have been saved, but it’s probably in the thousands,” he said.